In 2001, LondonOntarioSports.com publisher and editor Jeffrey Reed achieved the impossible. A disabled athlete with numerous skeletal deformities, and at age 39, Jeffrey pitched as a rookie for the London Majors of the semi-professional Intercounty Baseball League. In fact, during his entire lifetime, Jeffrey has beaten the odds, both as an athlete and as an internationally-recognized communications professional. You can read his life story to-date, Diamond Dream: Jeffrey Reed’s Inspirational Story of Hope & Determination here. In late-2015, Jeffrey and his wife, Elizabeth, decided to recognize others who have achieved greatness, and concurrently to inspire countless others with his story and theirs by establishing the Jeffrey Reed Courage Award. 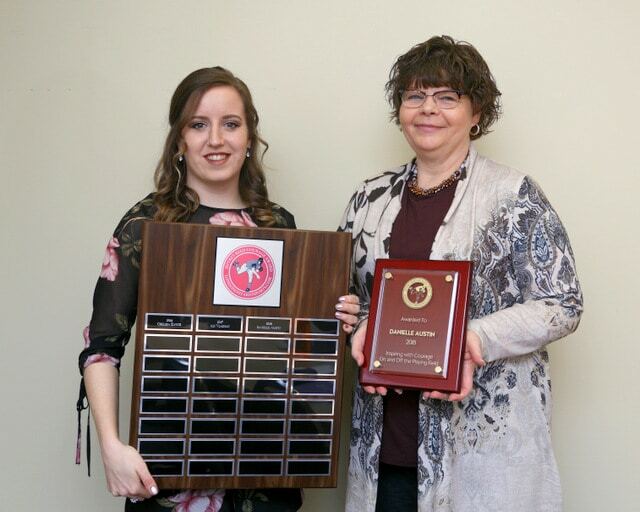 Each spring, one Southwestern Ontario athlete is awarded the Jeffrey Reed Courage Award. LondonOntarioSports.com awards this athlete with a $1,000 cheque, as well as a plaque at an annual banquet recognizing and celebrating his or her courage in sports and in life. The athletes nominate themselves with a 1,000-word essay. The annual winner is chosen by the editors of LondonOntarioSports.com. Here are the winners of the annual Jeffrey Reed Courage Award. 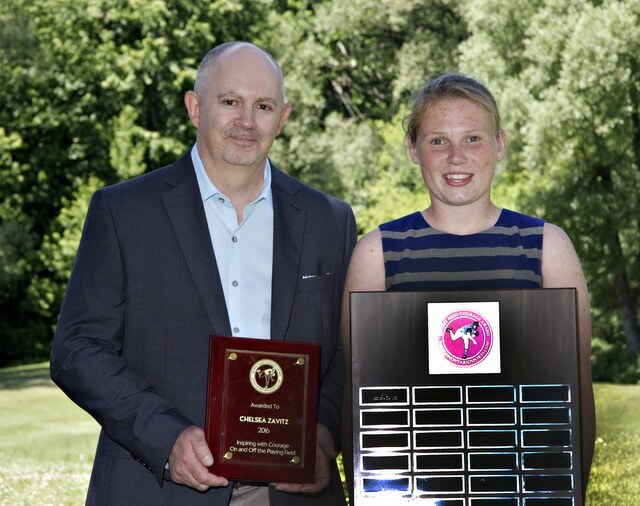 The inaugural winner of the Jeffrey Reed Courage Award, Chelsea Zavitz of St. Thomas, Ont. has suffered multiple concussions, including a devastating head injury in 2014, and continues to live with lingering effects of those injuries. Whenever she hasn’t been able to compete as an athlete, Chelsea has coached and mentored young women in basketball, hockey and soccer. Today, she is an advocate for concussion awareness. 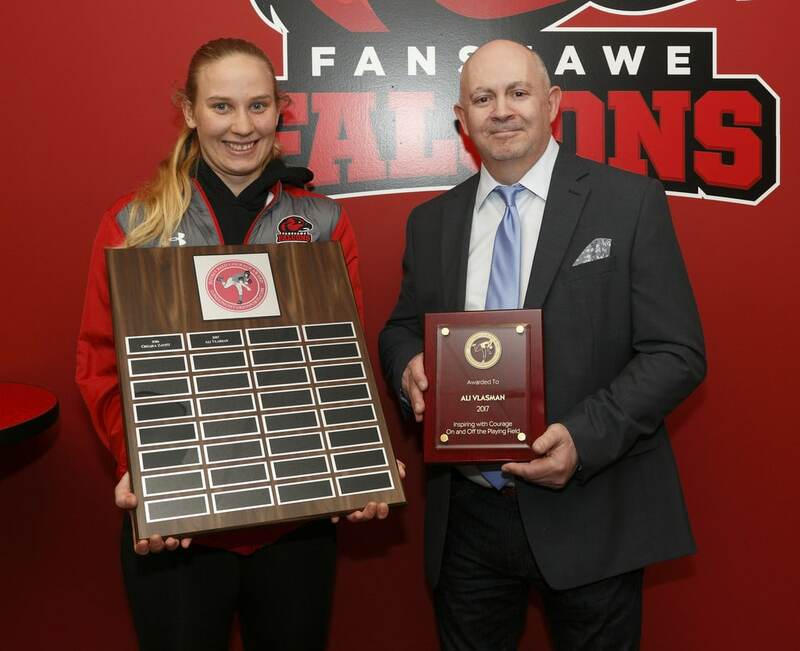 A former Windsor Lancers soccer player, Chelsea will graduate with a Business diploma from Fanshawe College, and plans to return to Fanshawe to study in the Project Management program in 2019 and to play another year of OCAA soccer for the Falcons. In July 2018, she was named an OCAA All-Academic student athlete. Chelsea is also a member of the FC London women’s soccer squad. During the 2018 season, she tore her medial collateral ligament (MCL) and posterior cruciate ligament (PCL) in her right knee, and her right hamstring during a February 2018 indoor game with the Falcons. Yet she worked hard, returned to the pitch and continues to act as an outstanding ambassador for the Jeffrey Reed Courage Award. Mount Elgin, Ont. native Ali Vlasman was named Fanshawe’s female athlete of the year for 2016-17, is was a two-sport star in Falcons soccer and basketball. In September 2018, Ali was named a CCAA National Scholar Award winner. Earlier that year, she became the Falcons’ all-time points leader on the basketball court. Considering the obstacles she faced, it’s no wonder Ali was the 2017 winner of the Jeffrey Reed Courage Award. She was forced to overcome personal tragedy following an automobile accident, poor grades and a learning disability. But through mentorship at Fanshawe College, she later excelled in the classroom, on the hardcourt and on the pitch. As a second-year soccer goalie at Fanshawe, she helped the Falcons finish 6-0 and recorded five shoutouts, allowing just one goal. During her rookie year as a goalie, the Falcons finished 9-0-1. She was also the Falcons’ female athlete of the year in 2017. When the going got tough, Vlasman never shied away from adversity, instead welcoming challenges while showing incredible leadership. Western University nursing student Danielle Austin of Parkhill, Ont. has always embraced athletics. 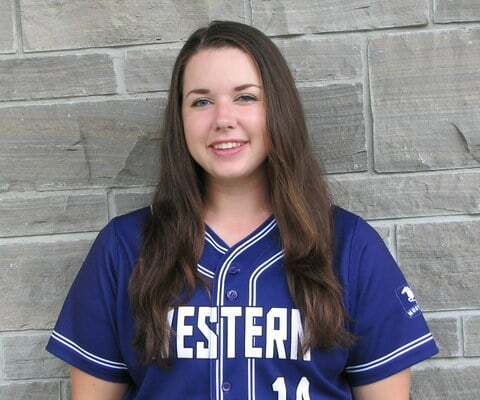 At North Middlesex District High School, she participated in basketball, volleyball, badminton and track and field for the Marauders, and also played minor hockey and soccer. In fall 2015, Danielle entered her second year of Pre-Health Science studies at Fanshawe College full of optimism. A member of the Falcons women’s soccer team, 2014-15 rookie of the year and an OCAA All-Academic athlete, she was enjoying the best time of her life. But that all came to a screeching halt in late- 2015, when she was diagnosed with Crohn’s Disease. After months of increasing her medication dose, and at the same time experiencing a decreased quality of life, her specialist recommended a different biologic medication. Danielle gained relief from the terrible disease in September 2016 through use of a new drug, but prior to its use, there was daily suffering for over a year. In June 2018, Danielle ran 63 KM from Grand Bend, Ont. to London, Ont. as part of her Kicking Some Guts One Step At A Time fundraiser for Chron’s awareness. She said she was inspired to make the run after learning about Jeffrey Reed’s own story of overcoming enormous odds. Still a competitive athlete, Danielle plans to help others with Chron’s once she graduates from Western. Like the previous Jeffrey Reed Courage Award winners, Danielle is an inspiration to us all.